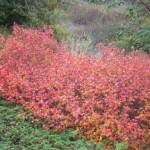 A low, wide spreading shrub. The foliage is glossy and fragrant when crushed. It has small yellow flowers in spring. Fall foliage color is bright red. 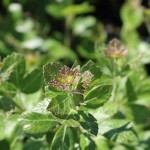 It is easily grown in full sun to part shade in average, well-drained soils. It is drought tolerant once established. 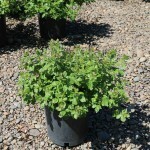 It is used in mass planting, as a ground cover, or to stabilize an embankment.